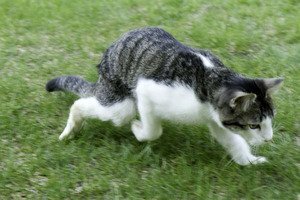 On April 20, CatTime.com reported on Corky, a cat that suffers from Bilateral Arthrogryposis, or condition that has left the feline’s rear legs crisscrossed and backwards — not unlike a corkscrew. The cat was mobile, but not without dragging his hind legs on the floor when he moved. A surgeon performed an innovative surgical procedure on the cat, using pins to uncurl and straighten out the feline’s deformed legs. So what’s next for Corky? Probably not adoption, as Adams-Ventzke hopes the feline may become a therapy pet. All of Corky’s surgeries are paid for through donations. For more on the cat, take a look at his Facebook page.